Every self-respecting geek knows that Superman was sent to Earth right before his home planet of Krypton exploded. It’s also part of comic-book lore that Krypton orbited a red star, as the switch to our yellow star’s light is supposedly what imbues Superman with his powers. Now famed astronomer Neil deGrasse Tyson has used his power of scientific reasoning to help pin down a real-life red star that could have hosted the home of the Man of Steel. Red stars can scale from dim dwarfs to mighty supergiants. But as astronomer Phil Plait explains, the lifetime of a red supergiant would probably be too short for the advanced Kryptonian civilisation to emerge, while known red giants are too far away from Earth to fit with Superman’s back story. That means Krypton had to orbit a red dwarf, which can be older and closer. Putting together colour, size and distance, Tyson has chosen the red dwarf LHS 2520, which is smaller and cooler than our sun and lies about 27 light years away in the constellation Corvus. In the upcoming Action Comics Superman #14, Superman visits Hayden Planetarium in New York City to observe his home star system with Tyson’s help – presumably to vanquish some kind of interstellar evil. 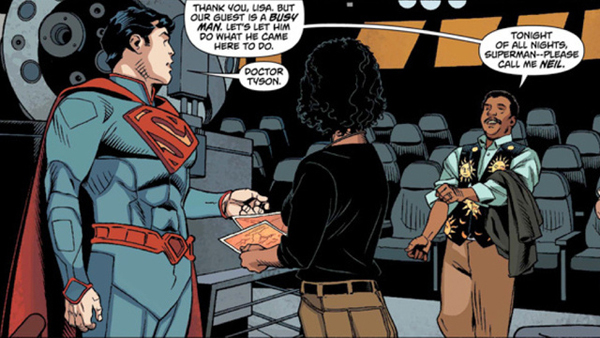 Plait offers one clue to the plot: Superman is 27 years old in the comic. According to the internet hysteria surrounding the ancient Mayan calendar, an asteroid could be on its way to wipe out the world on December 21, 2012. Obviously this is pretty unlikely — but if an asteroid really is on its way, could we take a cue from the disaster movie Armageddon in order to save the planet? In the 1998 film, Bruce Willis plays an oil-drilling platform engineer who lands on the surface of an Earth-bound asteroid, drills to the centre and detonates a nuclear weapon, splitting the asteroid in half. The two pieces of the asteroid then pass either side of Earth, saving the planet’s population from annihilation. But the group of four MPhys students worked out that this method would not work, as we simply do not have a bomb powerful enough. Students Ben Hall, Gregory Brown, Ashley Back and Stuart Turner found that the device would need to be about a billion times stronger than the biggest bomb ever detonated on Earth — the Soviet Union’s 50 megaton hydrogen bomb “Big Ivan” — in order to save the world from a similar sized asteroid. To do this, they devised a formula to find the total amount of kinetic energy (E) needed in relation to the volume of the asteroid pieces (⅔πr3), their density (ρ), the clearance radius (R) which was taken as the radius of Earth plus 400 miles, the asteroid’s pre-detonation velocity (ν1) and its distance from Earth at the point of detonation (D). Using the measurements and properties of the asteroid as stated in the film, the formula revealed that 800 trillion terajoules of energy would be required to split the asteroid in two with both pieces clearing the planet. However, the total energy output of “Big Ivan” only comes to 418,000 terajoules. In other words, we would need to construct a bomb about a billion times stronger than the most powerful weapon ever built in order to save the world in this way. They also found that scientists would have to detect the asteroid much earlier if we were to have any chance of splitting the asteroid in time. On top of this, the asteroid would need to be split at almost the exact point that it could feasibly be detected at 8 billion miles. This would leave no time for Bruce to travel to the asteroid and drill into its centre — let alone share any meaningful moments with Ben Affleck or Liv Tyler along the way. Student Ben Hall, 22, from Haverhill, near Cambridge, said: “One possible alternative method would be moving the asteroid via propulsion methods attached to it. What is certain is that most methods would require very early detection of such an asteroid and very careful planning in deriving a solution. “I really enjoyed the film Armageddon and up until recently never really considered the plausibility in the science behind the movie. But after watching it back I found myself being more sceptical about the film in many areas. “I think that directors attempt to make films scientifically-accurate but find that a lot of trouble is run into in what can and cannot be done, thus leading to falsification in the science to make movies more interesting or visually appealing to the audience. The science papers, entitled Could Bruce Willis Save the World?and Could Bruce Willis Predict the End of the World? were published in this year’s University of Leicester Journal of Special Physics Topics. The other three group members also graduated with Firsts, and are set to start PhDs. Course leader Dr Mervyn Roy, a lecturer at the University’s Department of Physics and Astronomy, said: “A lot of the papers published in the Journal are on subjects that are amusing, topical, or a bit off-the-wall. Our fourth years are nothing if not creative! But, to be a research physicist — in industry or academia — you need to show some imagination, to think outside the box, and this is certainly something that the module allows our students to practice. “Most of our masters students hope to go on to careers in research where a lot of their time will be taken up with scientific publishing — writing and submitting papers, and writing and responding to referee reports.